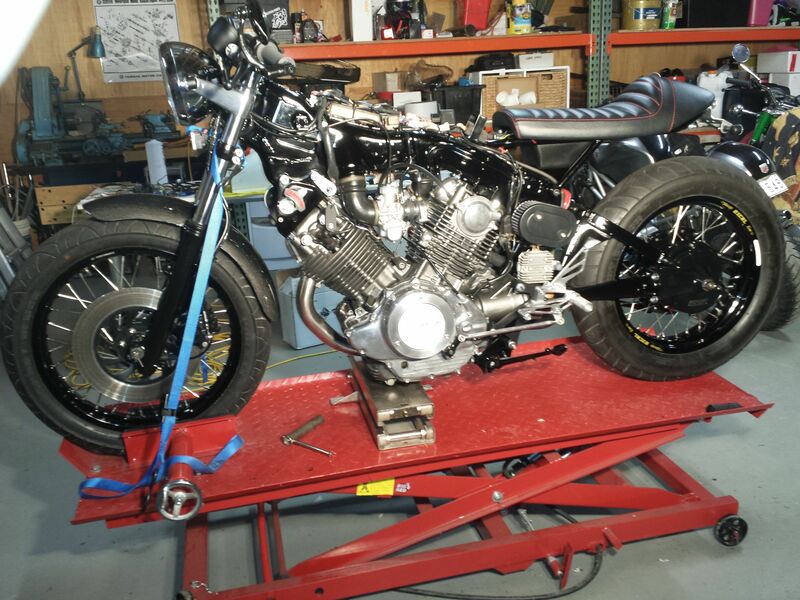 I am going to log the progress of my XV750 café build so every one knows how to do it. This is how my bike looked when I got it. Pretty nice a shame to chop it up. 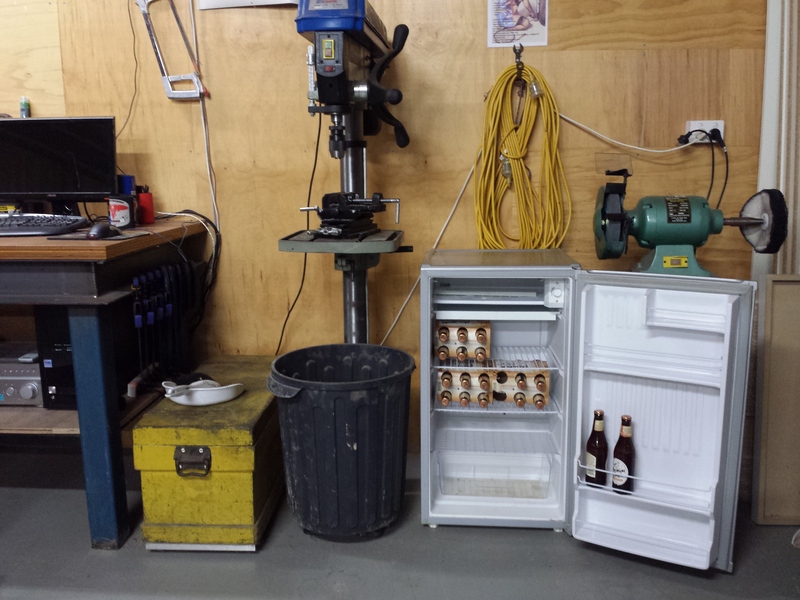 The first job is to stock the fridge. Next set you bike up. 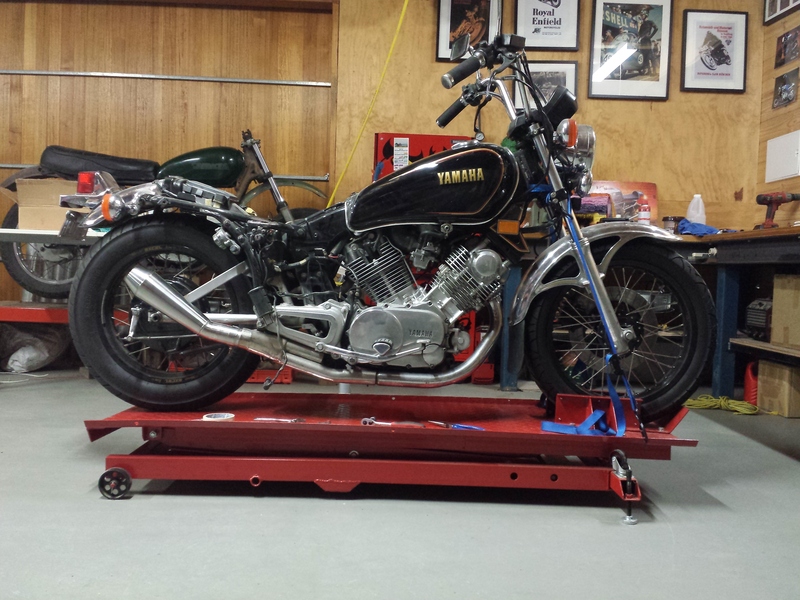 I use a bike lift to make things a bit easier on my back. Now before the questions come rolling in, I have already built myself some wire wheels. I will get to that one later. Ok time to start ripping it down. 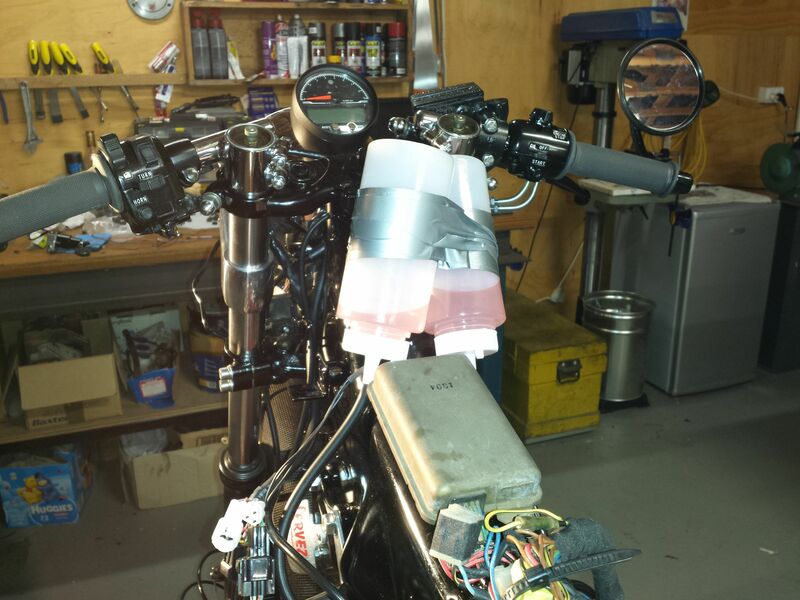 Tank, seat, side covers and battery are first for me. 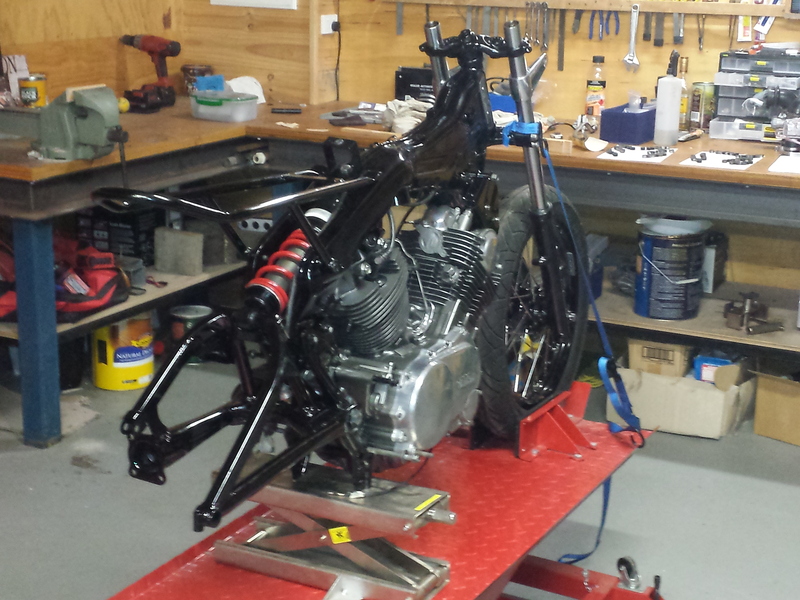 Start to un plug the wiring at the back of the bike. Make sure you label everything even if you think you can remember the most basic things like + & – to the battery label it anyway, in a few months time when it comes to putting it back together you will be glad you did. and it will save you a trip to the auto elec. Take lots of photos as well. 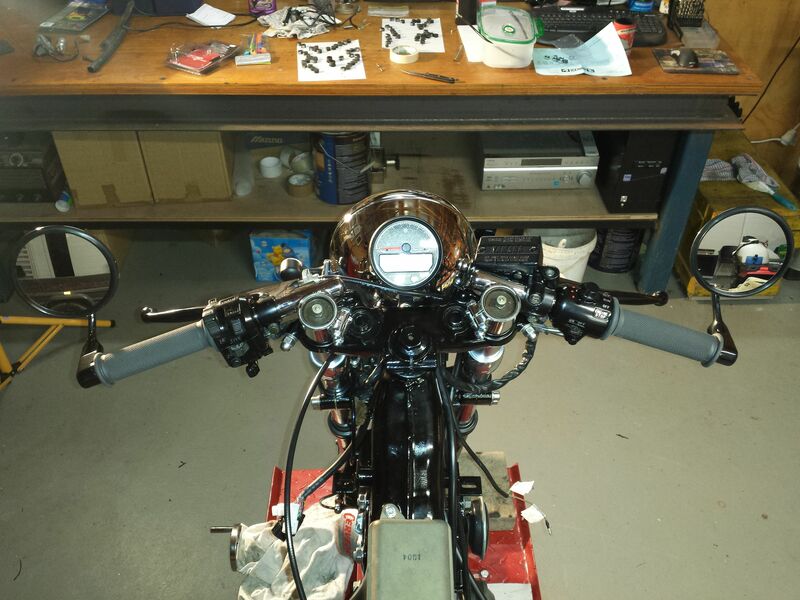 Foot pegs, brake and clutch peddles are next to go. 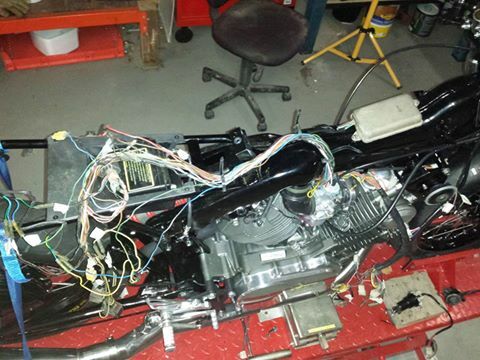 Next I removed the handle bars and the whole back sub-frame. 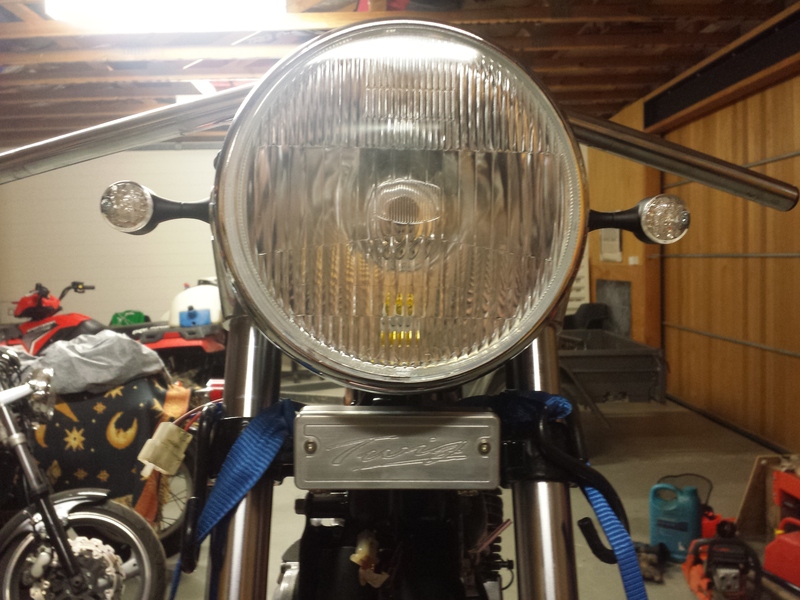 Next to go was the gauges and headlight, there are a lot of wires in the headlight so label, label, label. If you haven’t had a beer yet then its time to crack one, you deserve it. After all this you should end up with a big pile of stuff to sell. Remove the forks and she’s all in bits. 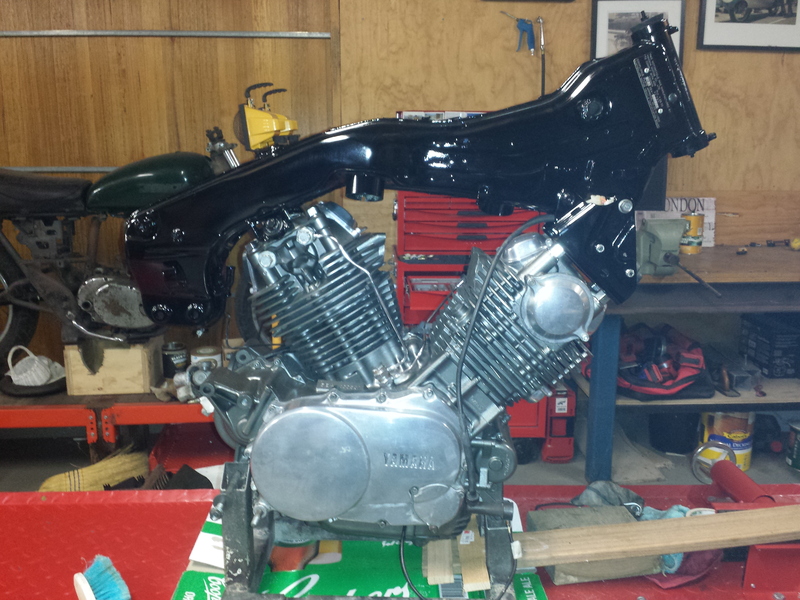 Now its time to clean, polish and paint. This is the most boring job but also the most important to get good. 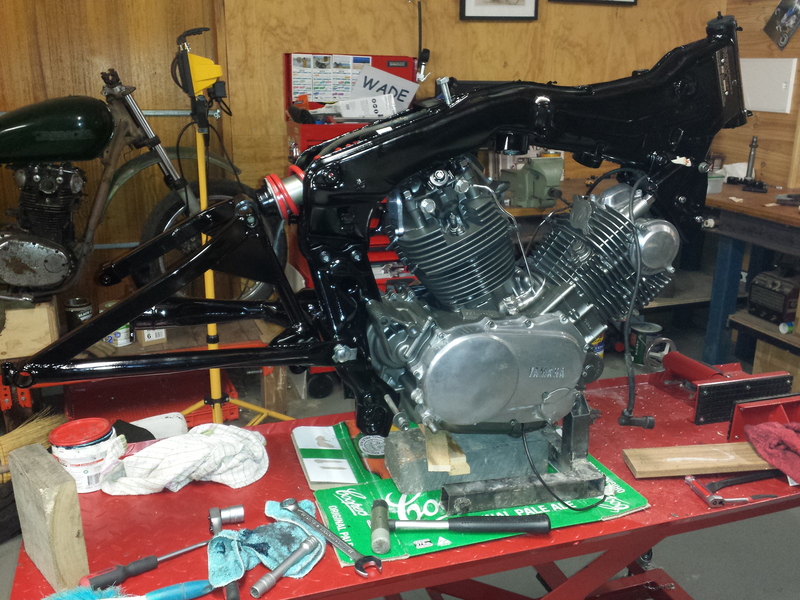 Cut corners here and the finished bike will look good but not perfect. I have taken the forks apart for a paint and some new seals. 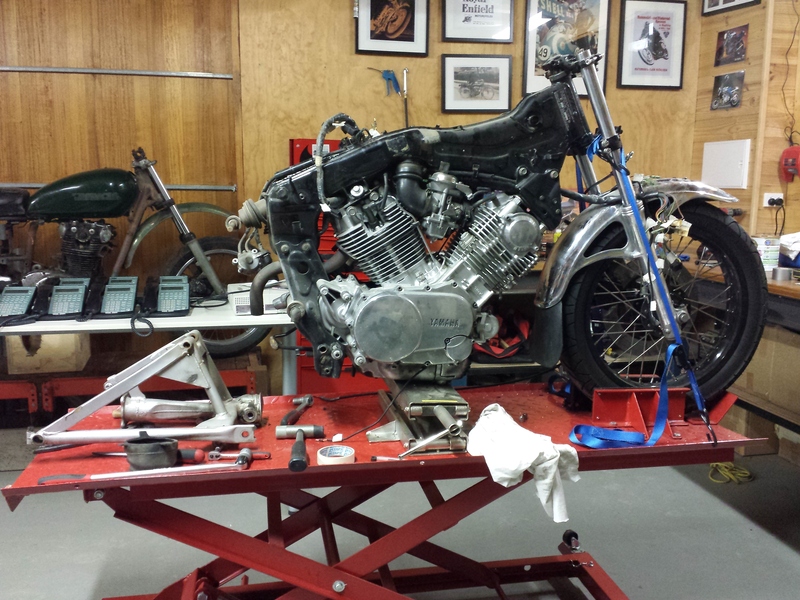 I am working on making a manifold to fit up some Mikuni VM34 carbs to get the thing running a whole lot better. The prototype is looking good. 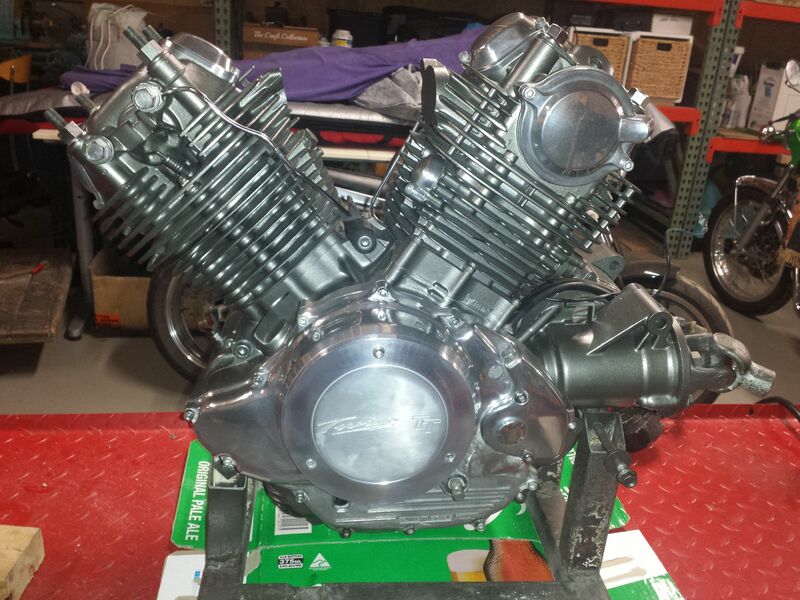 I soda blasted the engine and now its ready to paint. 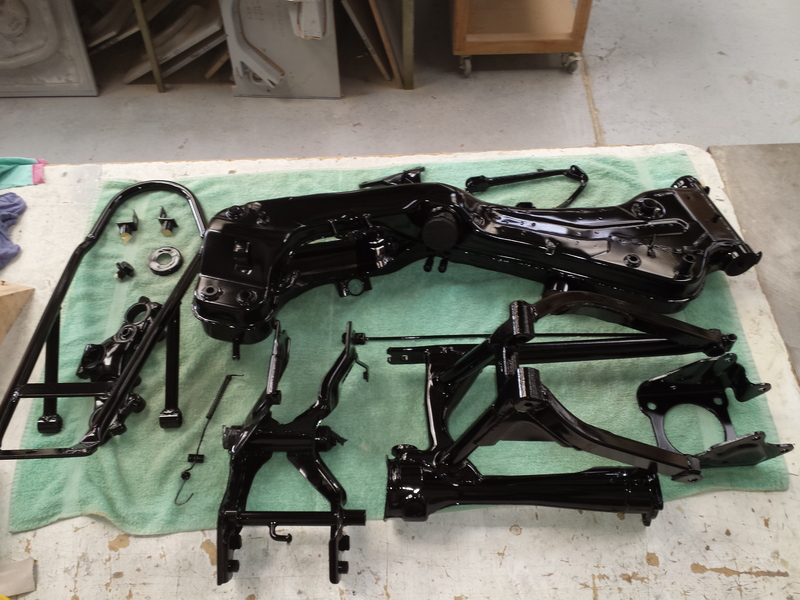 All the frame parts have now been sandblasted and painted. 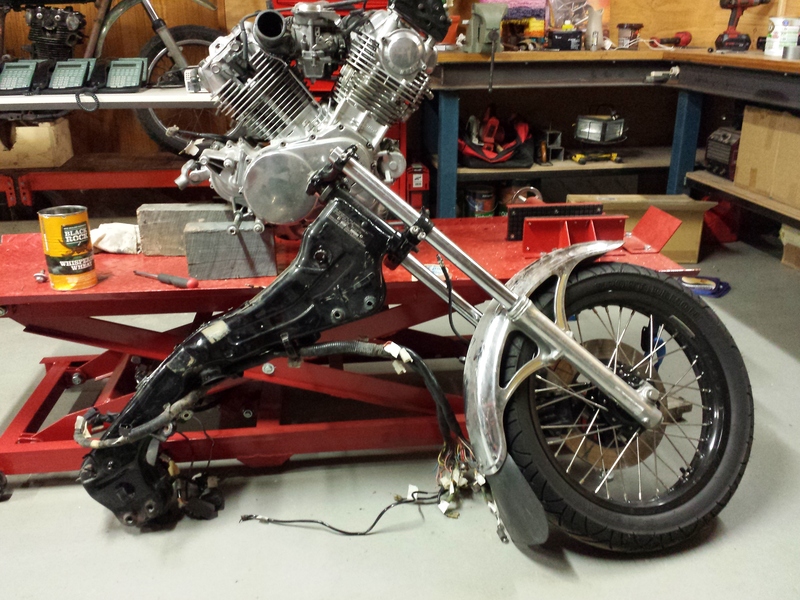 Now the forks, front wheel and subframe. 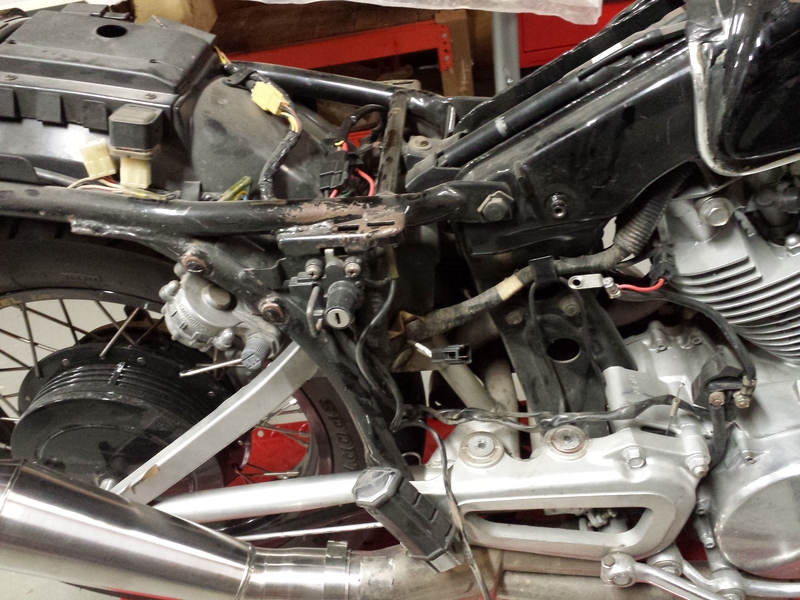 Well I’ve done a bit of work on the right side of the bike. 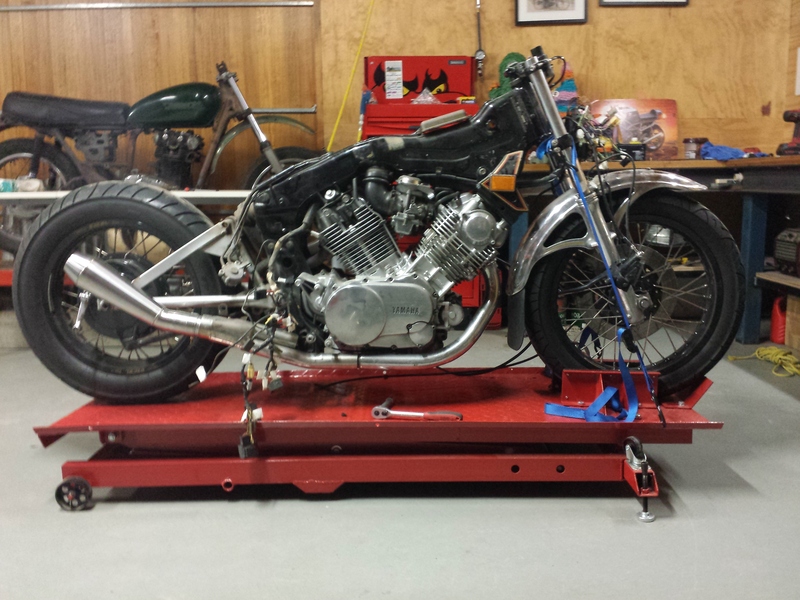 Hooked up the exhaust, polished up the engine cover, replaced all the bolts with stainless steel and got the rear brake set up. Got the bendex spring fixed, a new clutch cable fitted and the gear shift sorted. Now the shift is upside down race style. That will take a bit of getting used to. Still have some polishing to do. 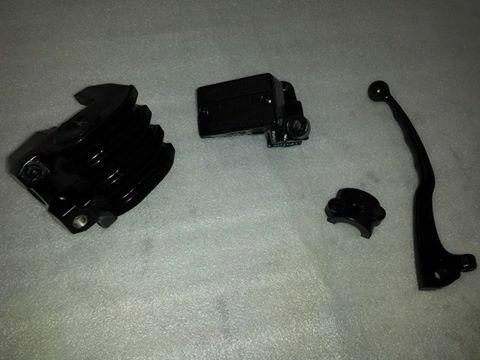 I have repainted the brake components. I have now rebuilt the brake calliper and fitted the brake lines which I need to get a shorter one as it is way to long, you get that when changing from cruiser bars to clip-ons. 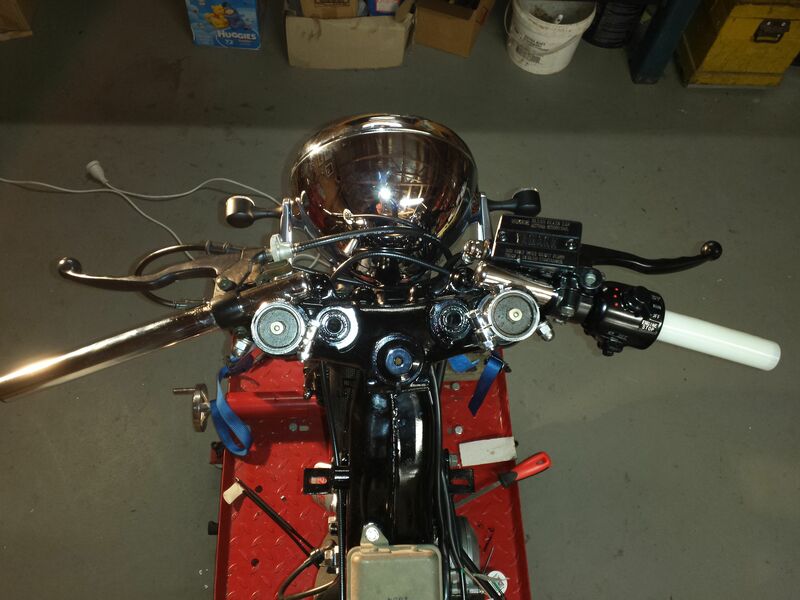 I have also fitted up the throttle cables I used the right hand switch block and cables from an XS650 purchased from Mikes XS http://www.mikesxs.net/ a great place to get late 70’s early 80’s Yamaha parts. A few more bits n pieces to do then its time to get stuck into the wiring nightmare. Got the wire roughed in so I fired it up with a makeshift tank. 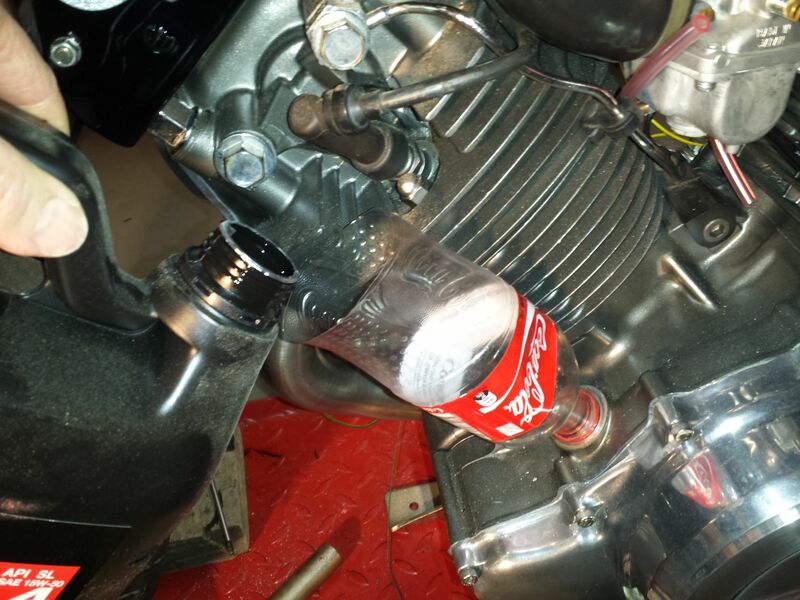 Di you know you can use a coke bottle to fill your oil, funny they have the same thread just screw it in. Well after a serious headache I finally have the wires sorted and all I need now is a tank and I’m done. 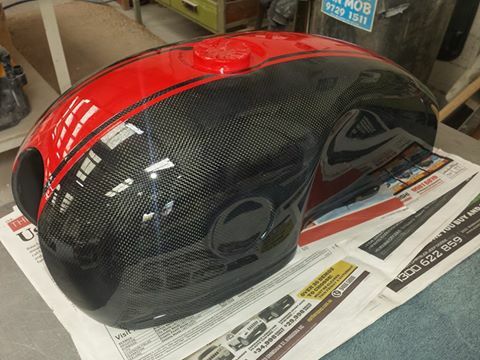 Ok so I went nuts and made myself a carbon fiber tank pleas don’t ask for one as this is a one off. 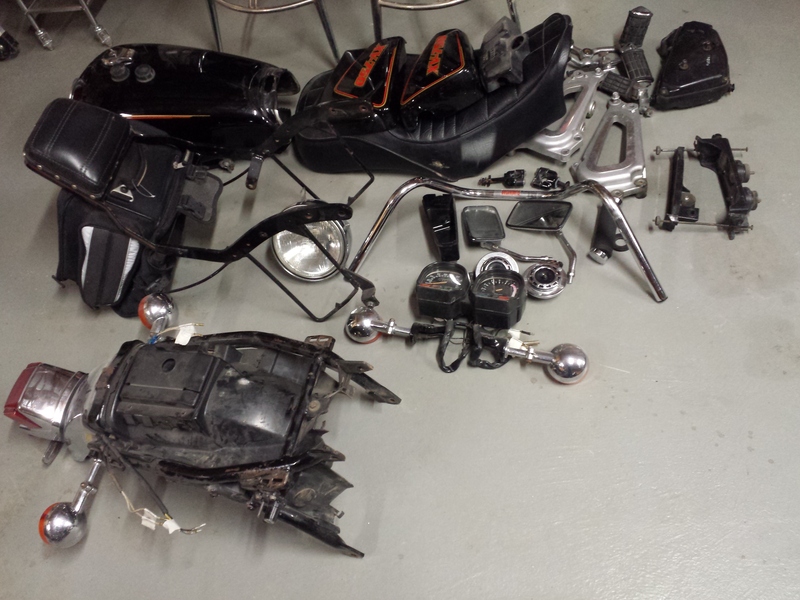 If your after one you will have to make a decent offer on the whole bike. 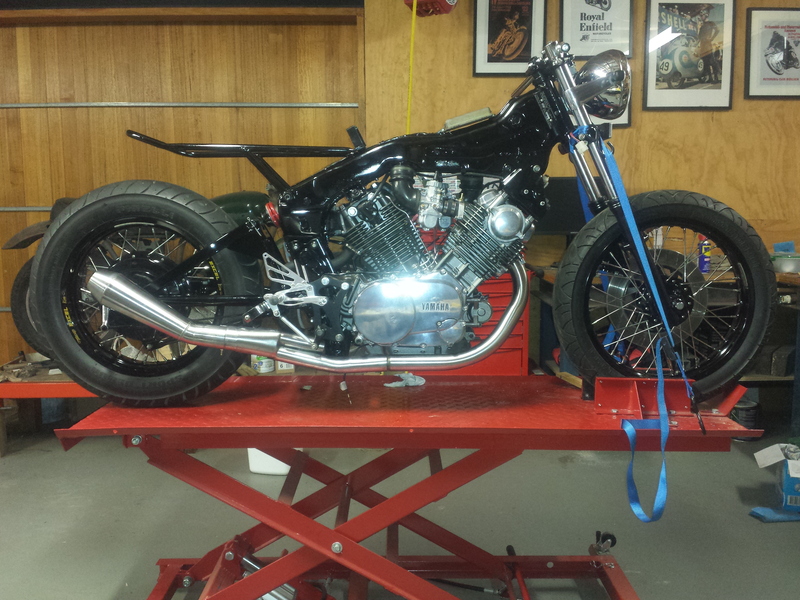 Nick made a short YouTube of the finished bike check it out. Have anymore pictures, I’d love to see the steps to the finished project!! Very nice pictorial! Yes would like more information on the rear sets you used and mounting brackets! I thought for a moment they looked too high – however second look and I really like where they are mounted. Love this, thanks so much for sharing !!! any chance you have the updated pictures ? Just wondering regarding the additional parts / Tyres etc what was the approx additional spend? 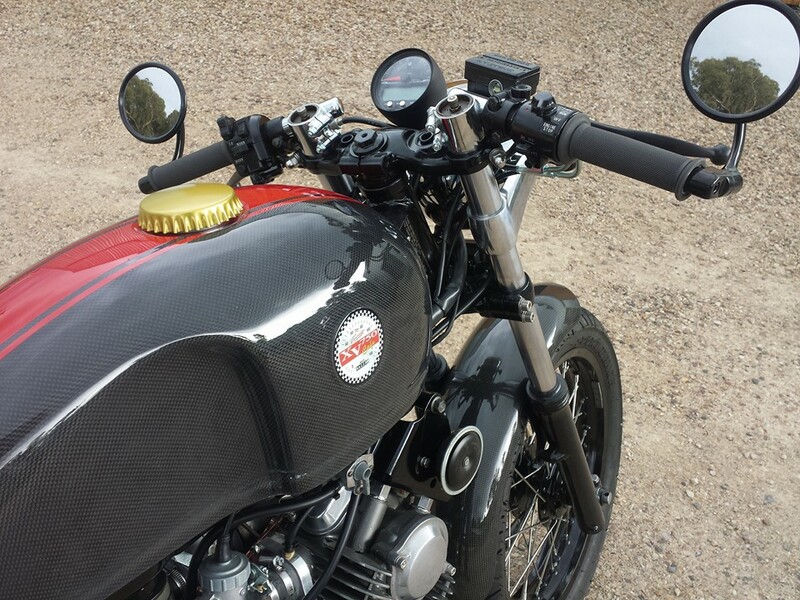 I’m thinking of selling my caferacer to do the same project, really appreciate it. so that’s the stock sub frame? also where’d you purchase the seat? 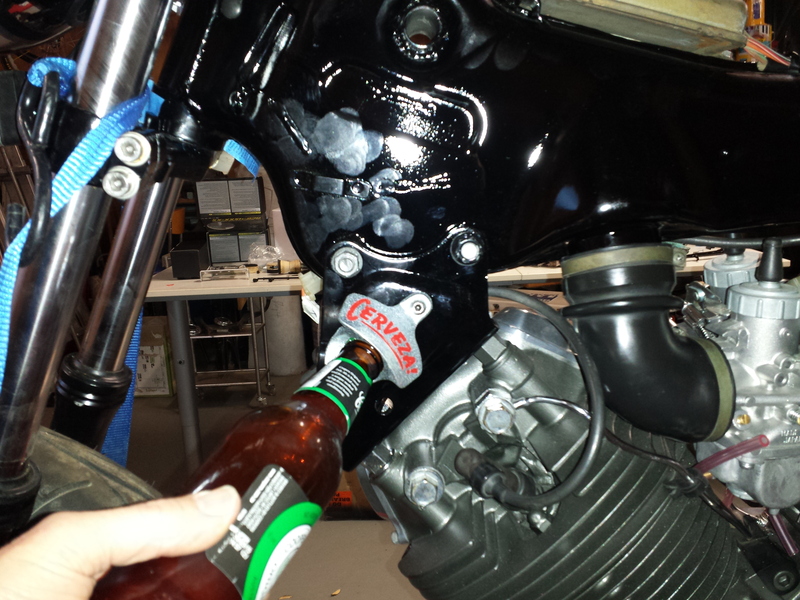 Any updates on those rearset mount brackets yet? I will be starting a rebuild of an ’82 920, and don’t like the heavy stock brackets. Thanks! Can you tell me what air cleaner element you used. 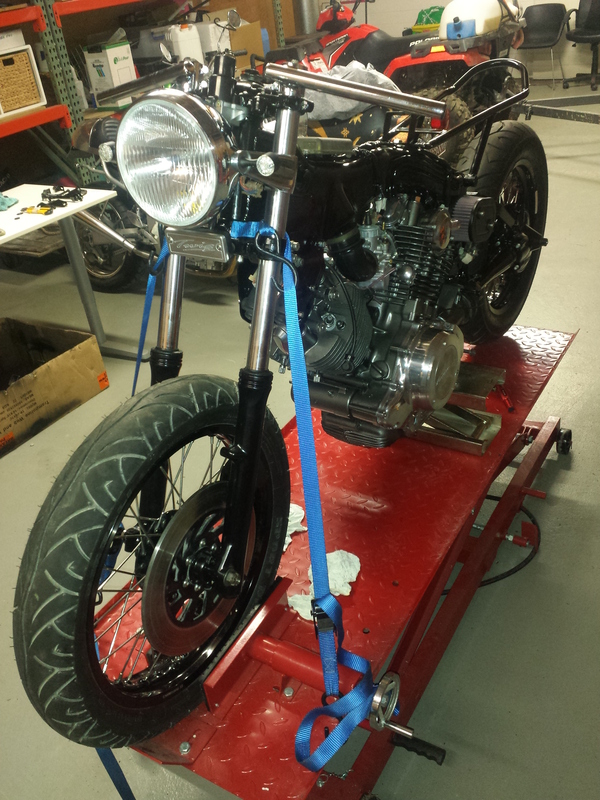 what is the seat heigh of the bike after build ? This all depends on if your using the stock front end or the R6 and how much your pushing through the fork legs. I will measure up and get back to you. Thank for your reply. 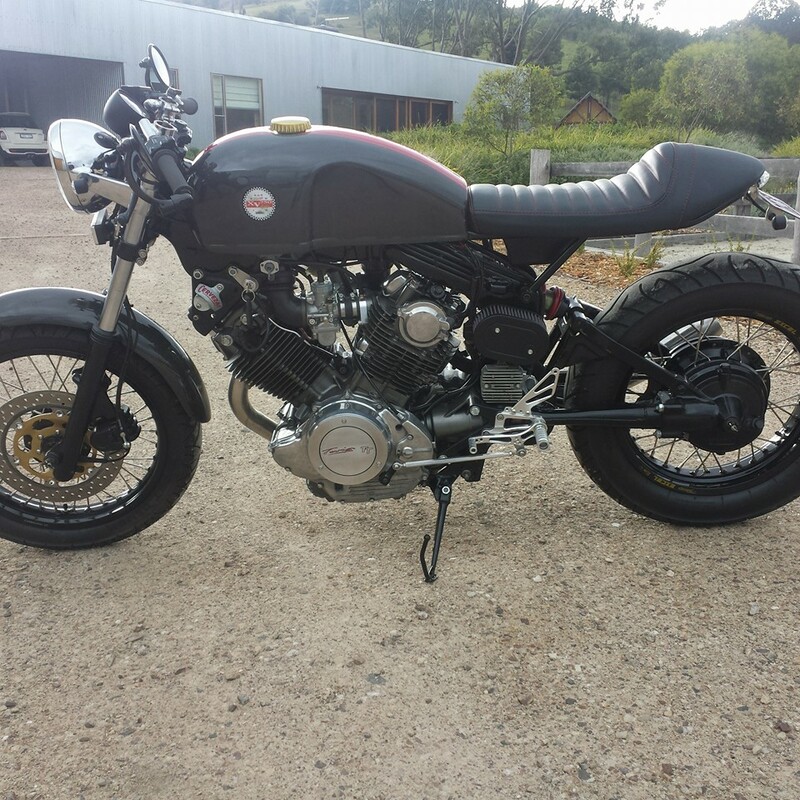 I want to purchase the basic kit from your to build my 82 Virago 920. Im a short guy( 5’4″ with 28.5 inseam), so seat height will be the biggest problem for me. Also, will the R6 front will lower the seat height? 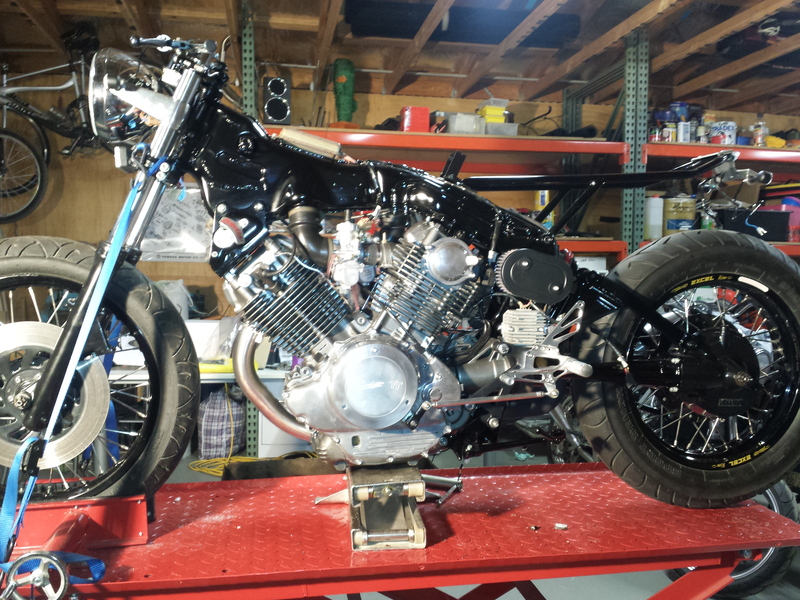 How hard to put the R6 front end to the Virago? 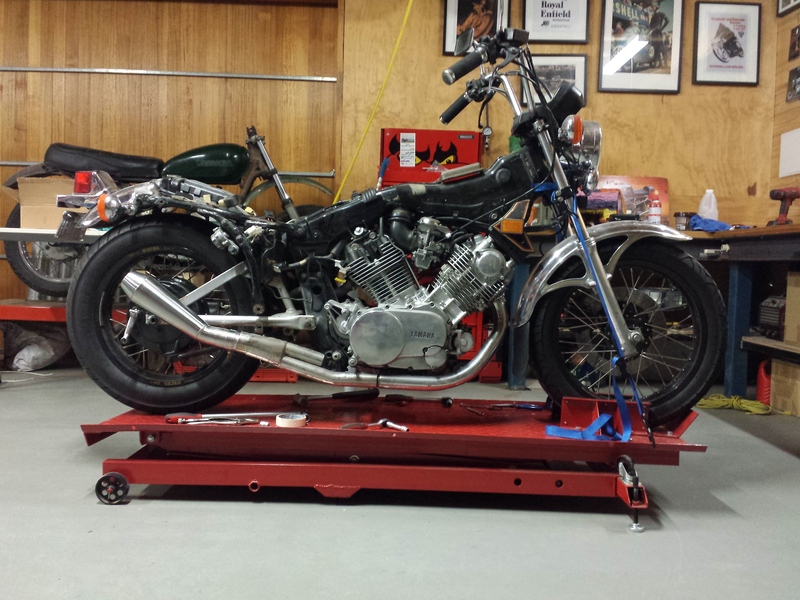 I measured up the stock seat height and with the R6 forks. Do these type of bike have a general name ? Btw congrats , it looks beautiful! 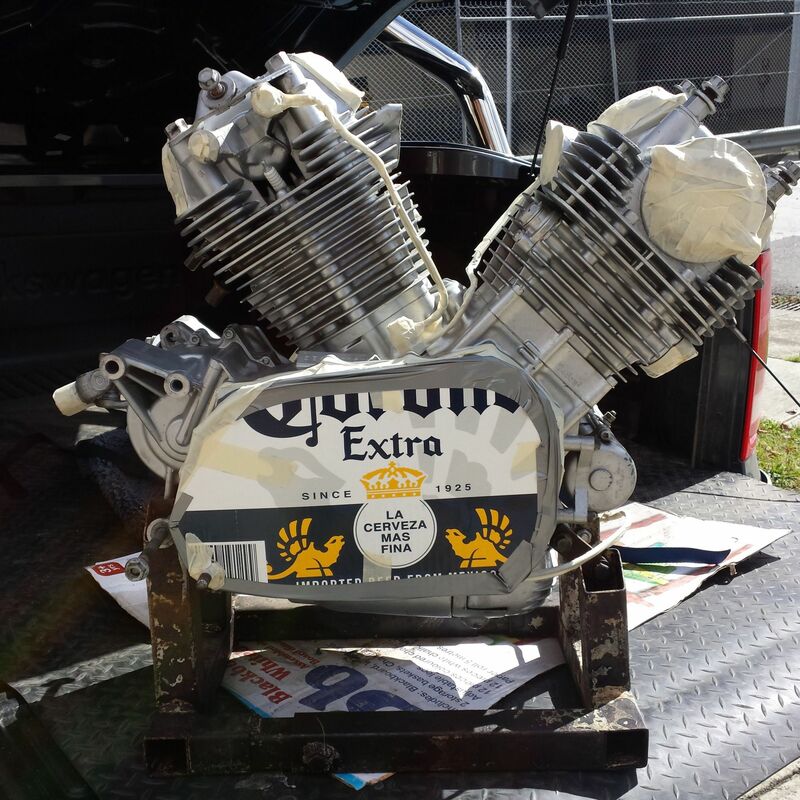 I just got a set of carbs and sent the bike to someone who knows how to tune. This is something I need to learn. Dig the tank. Well done . Wheels give it that proper look. Hi, great bike i am in the process of getting the information I need before I start. One of the biggies is stay with Std alloys easy or a world of pain to get spoked wheels? So just wondering were did you get your from/of? Is that a Cooper’s Pale? Where are you based? 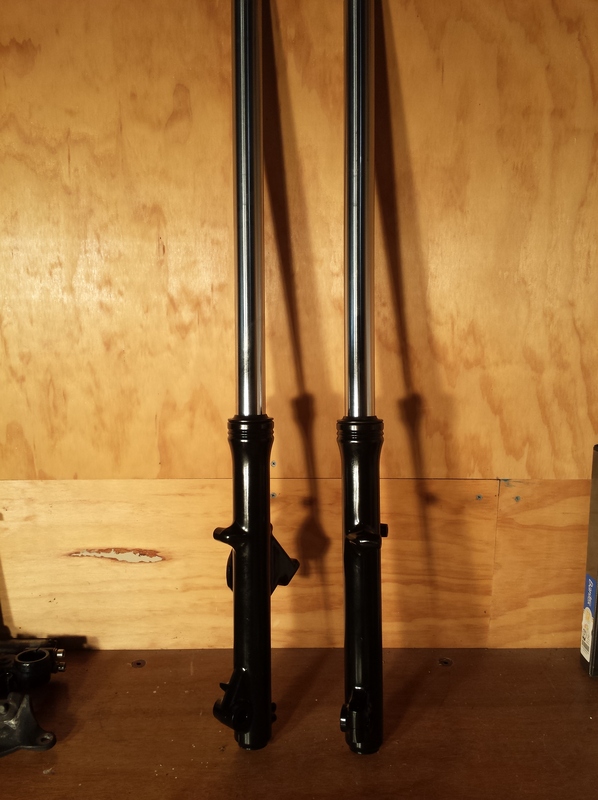 Hi Twig, love your work, Im just starting my XV, a question about the forks, I’ve lowered the forks through the triple clamps by 50mm, and need to firm them up,. 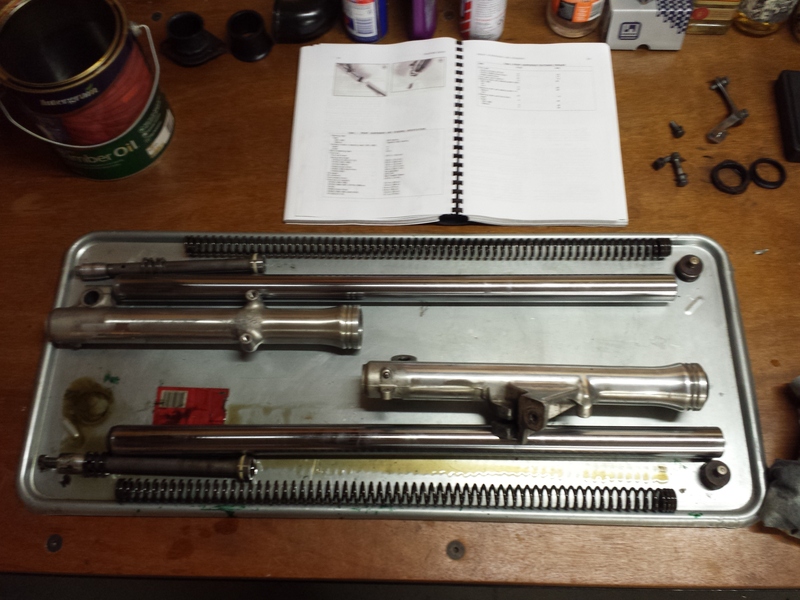 how long a packer did you add to stiffen the springs, and what oil weight and quantity did you use? Hi Neil, I used 3mm on the top. Keep in mind I weigh around 70kg. This would also depend on the condition of your springs. I used the standard recommended oil. 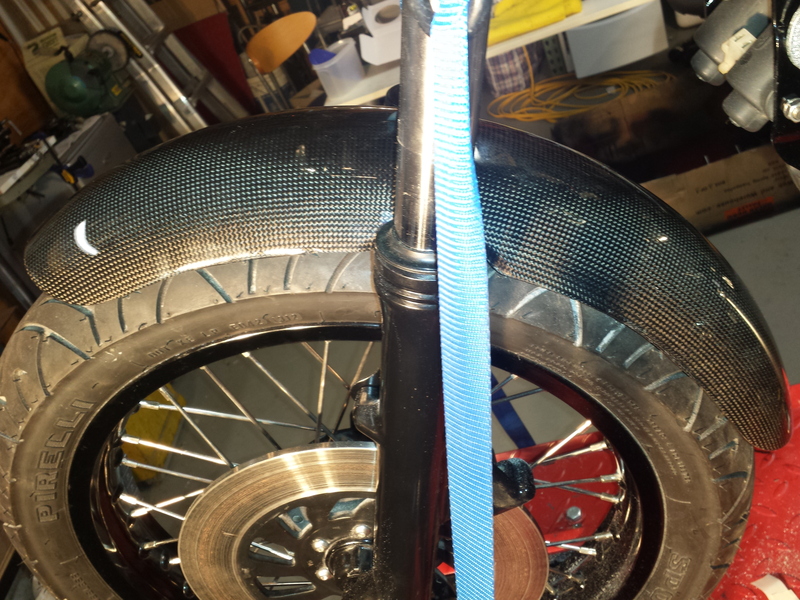 If you relly want to get this right I sugest you see a suspension expert. 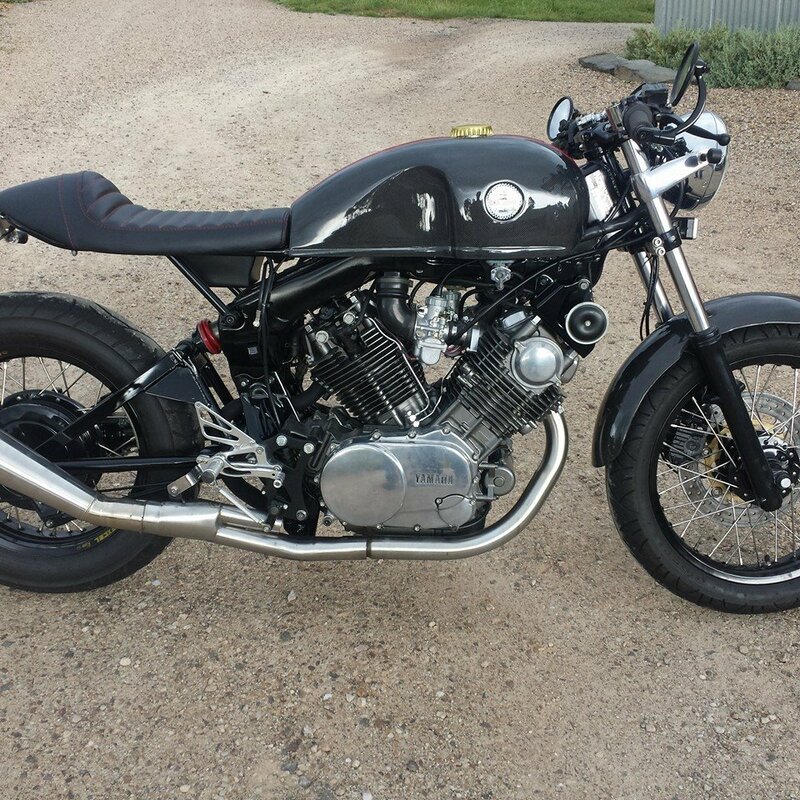 Nice work on the Virago. Where did you find the sub frame or did you make it? I have been looking for one without any luck. I am currently building a 500 and picking up a 900 tomorrow. Really like the tank. Thank you very much for sharing your knowledge! The pictures are GREAT! I’d like to know the size of your rims/tires. It looks like you used the stock forks…..right? Best of luck, GREAT looking bike! Thank you VERY much for your response and input. The whole wheel exchange sounds rather daunting! I’m not sure I’m up to that task, but the information you provided is invaluable! Thanks so much. PS: is it possible to access more of the details of your build on line like the page you sent about the wheels? Thanks in advance……. Hi! Nice work. I have a question about the wheels. 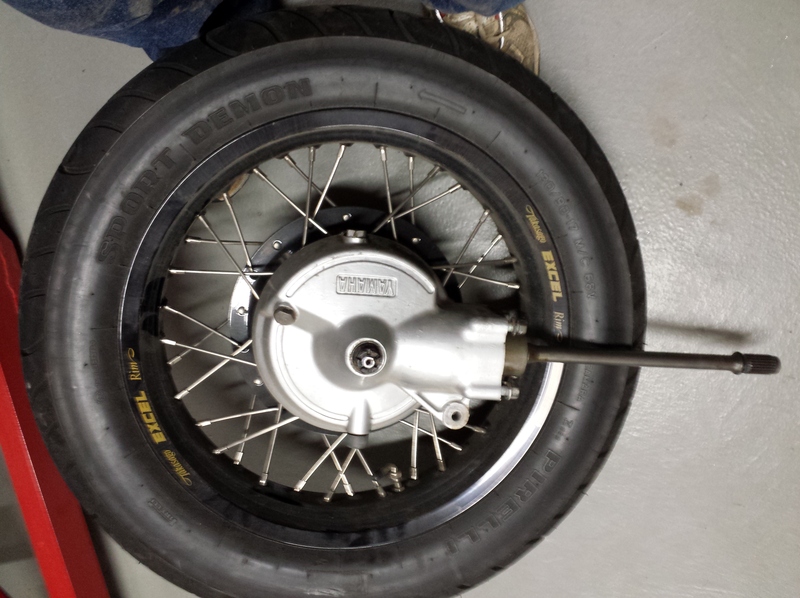 Do you also use XS650 front wheel axle? And does the XVS650 rear hub from 2007 year VStar model will fit? I use the standard XV front axle and swap the bearings to match. I believe that all the XVS hubs are the same. Keep in mind that there is a little machining to do on the hub. 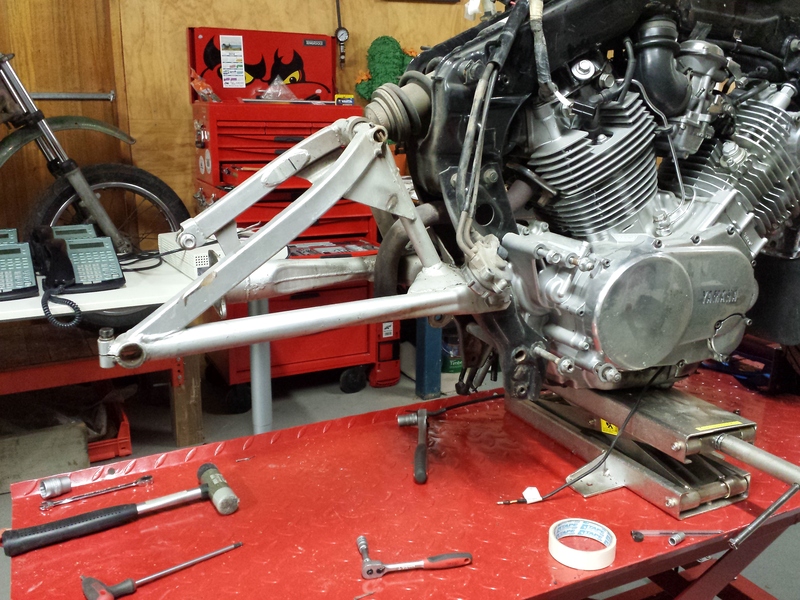 You mean to machine down 6mm of rear axle width and replace the drive gear from XV1100? Or there is something else? Correct there is a little machining to fit the drive gear as well. Just need to remove some material from the corner of the hub. This will be obvious when you see the parts. The next question(S)…….please be patient, there may be more…:) The wiring……did you just modify the existing or replace the entire harness? The electrical bits……relays and such, mostly hidden under the tank? OH, and the battery? Where the heck did you hide that? Thanks in advance! Where did you get the rear spokes on 17″ rim? 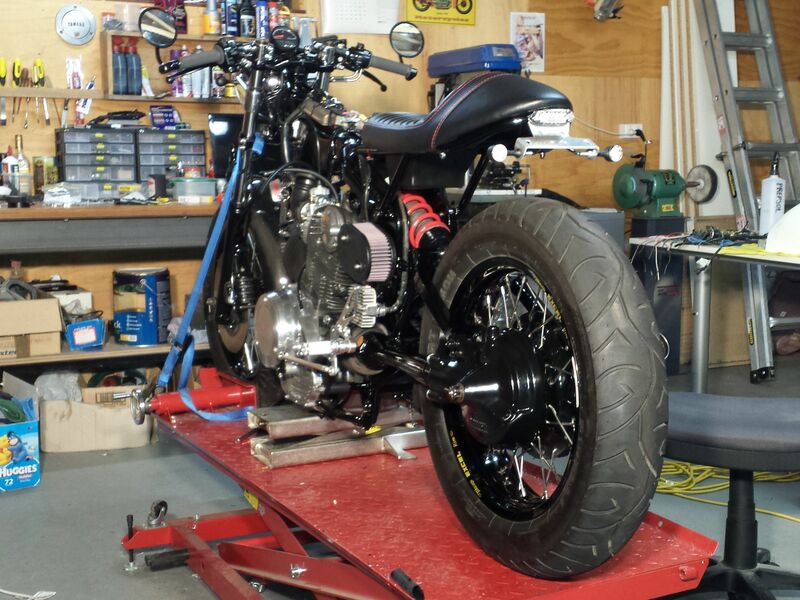 Hi there,that is a great looking bike and it has inspired my to take on a similar build of my own. 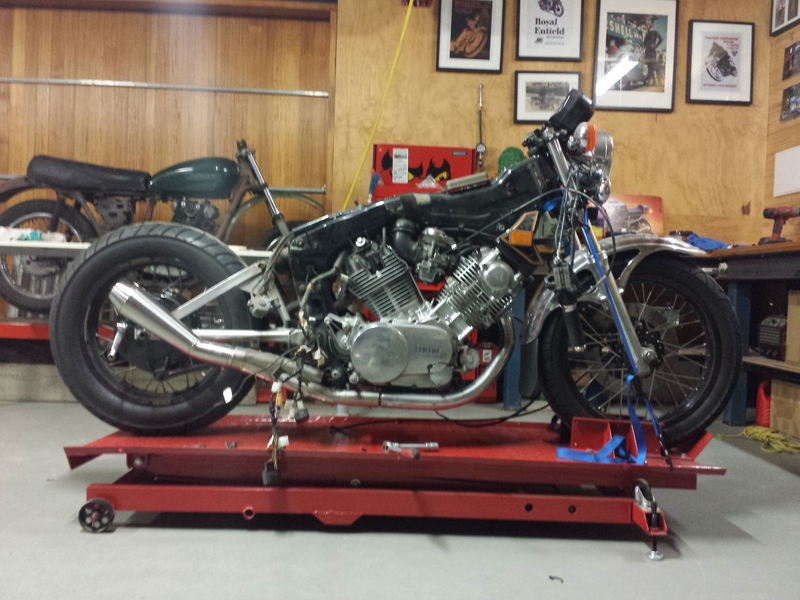 I have a 1981 xv 750 and have been working on the rear wheel. 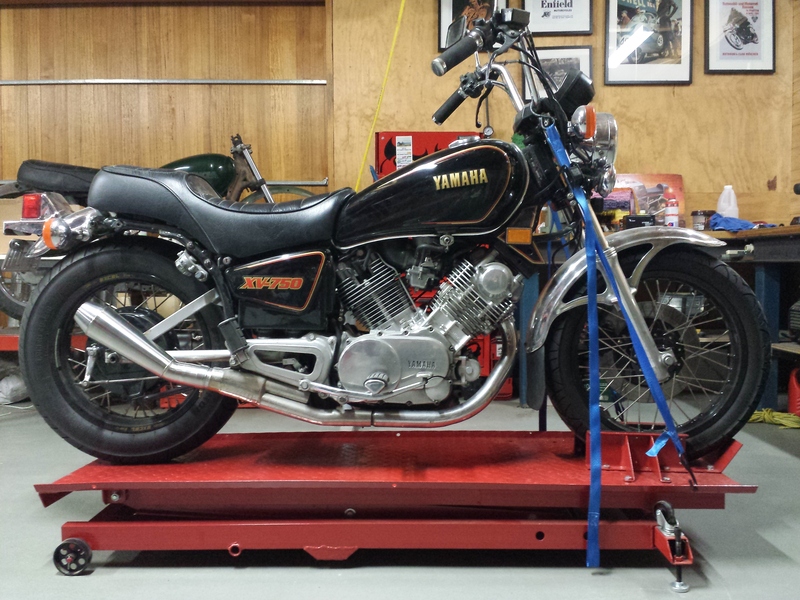 I have followed your example by using an xvs v star 650 hub,1100 clutch and have had 6 mm taken off of the axle pin, plus changed the bearings to 17 mm from 15 mm. I just need to machine a spacer for the hub that goes between the bearings as the xv 750 one is too short. everything is looking good but my main question is. I have an off set of around 10 mm on the centre of the wheel. Did you have this issue and if so is there a way around it. Yes you can adjust the spokes to offset the rim to be more central. You may not get it perfect but pretty close. Thanks for that, I checked it weekend and I only need 7mm. Hey, what a beautiful built. I wonder, is it something hard to do the built or is it possible to do with very basic knowledge ? I’d like to get into a project. 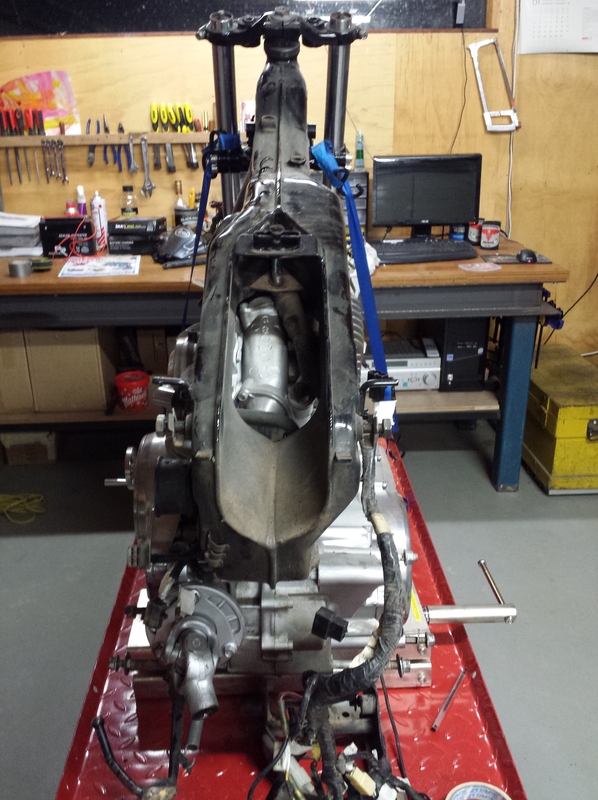 when you painted your engine, before soda blasting did you disassembled in it in parts? Or just covered it with tape the parts you don’t want to blast? And what kind of paint did you use? 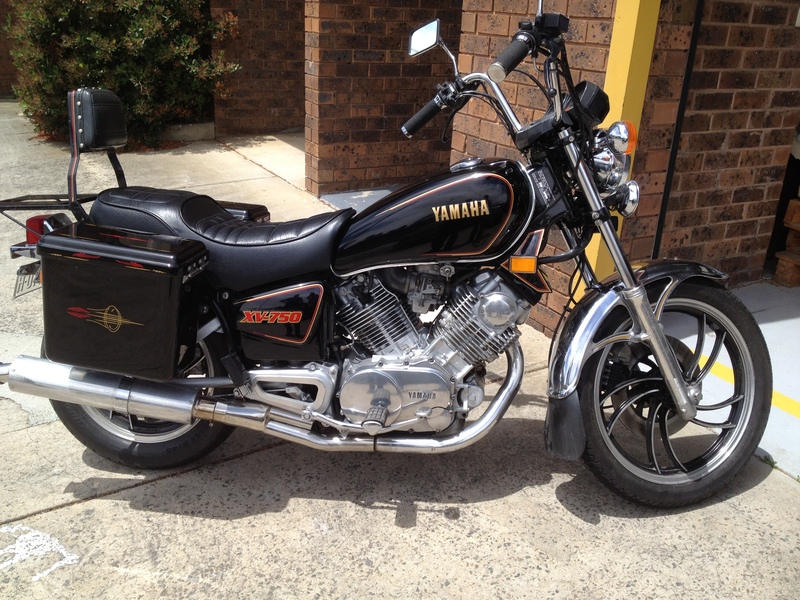 Hi I was up your way picking up my new project a xv750 when I saw your bike for sale. I cant believe the price seems a little cheap for the amount of work and the Excellent out come . Beautiful looking bike. I think this is a fair price. I think lot of people really over price bikes like this. Bike looks amazing. I’m doing an 83 midnight special. 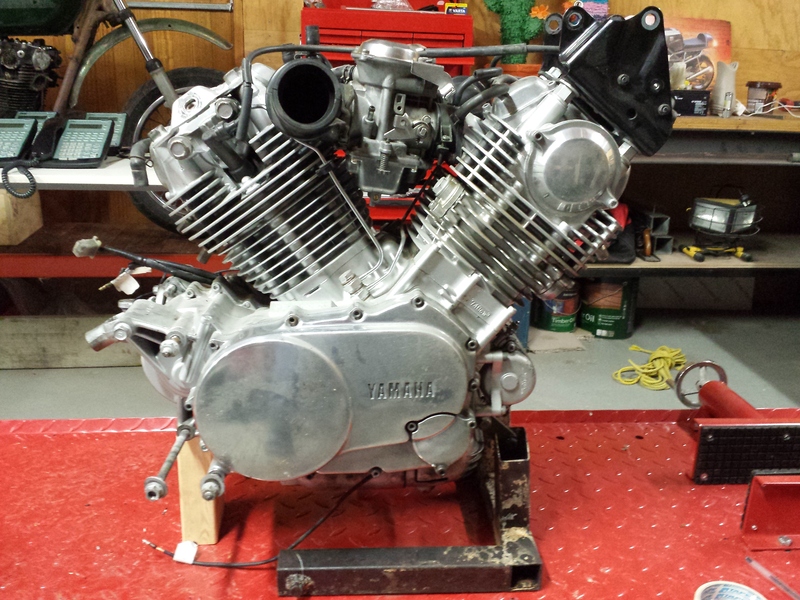 All is well except the battery and wiring. Did you use any of the original wiring? I’m struggling to hide everything in the headlight and underneath the seat. Any tips? I did use the original wiring and it was a nightmare. I chopped quite a bit out and hid it under the tank. The bike looks great. Can I ask where you got the new sub frame from or was it made to suit? 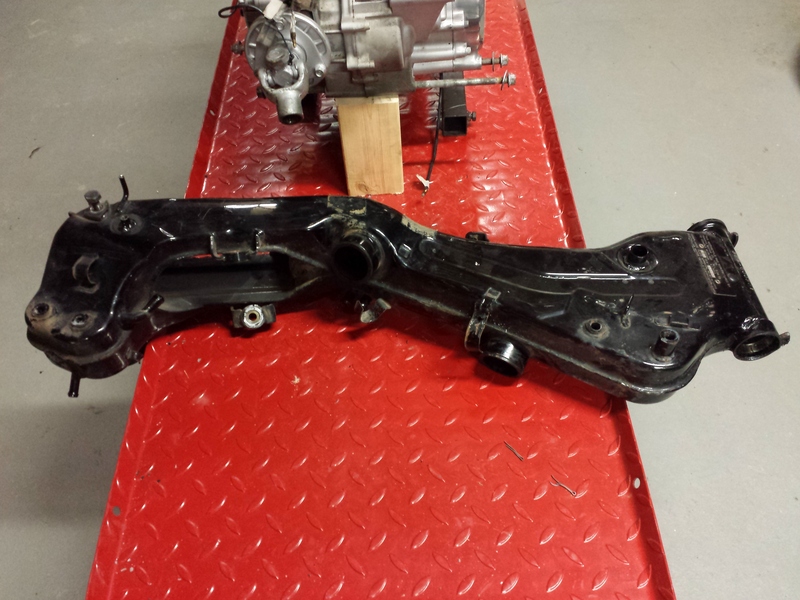 We make these subframes and plenty of other parts. you can purchase them form our online store. I have a question witch kind of tank is it?? is it from another existing motorcycle?? What size Front and rear wheels did you use and from what bike ( hubs ) and what type of rear wheel travel did you end up with ? and what type of rear shock ? 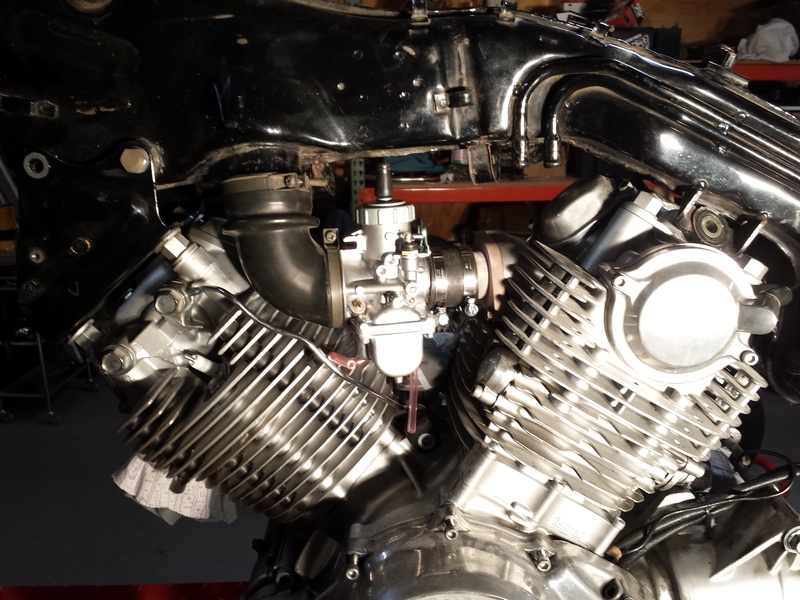 How did the carburetors works for you and how’s the bike? I Have now sold this bike. the carbs took a fair bit of messing around to gt them to work well. Hi! where have you bought front lamp holders? Great looking bike! Can you use the air filter adapter plate to attach air pods? Also, how did you fix the bendix spring for the starter? Thanks. The air filter plate will not accept pod filters. I suggest that you consult your local mechanic re the bendix spring. Hi! Where did you hide the rear brake stop light switch? It,s in behind the brake lever (basically its original position).